Here is an egg, which is good for Easter or to put in your egg carton to replace the ones you’ve eaten. You can even make this egg, put arms and legs on it and make it dance around. Whatever you choose to do with this real size egg, it is super easy to crochet, so enjoy! Note: Fill egg with fiberfill while decreasing. Finish off, weaving egg shut. If you need help with this pattern, no worries just let me know by leaving a comment! This entry was posted on Thursday, March 26th, 2009 at 12:01 AM by Rachel Choi	and is filed under Free Crochet Patterns. You can follow any responses to this entry through the RSS 2.0 feed. You can leave a response, or trackback from your own site. On round 2 when it says to do 2 sc in one stitch and sc in the next, do you do that all the way around like that? I have done the egg and to me it don’t like right. Is there some way I can send you a photo of it and let you look at it and see what you think? I will tell you this that I used a heavier yarn so the egg is bigger, but something just dont like right to me. Your egg doesn’t look bad at all! The only difference I see comparing my egg to yours is that mines is slightly skinnier and more pointy on top. Hmm..maybe it is because of the heavier yarn, not exactly sure. Or perhaps it’s the way it’s stuffed? Did you get the exact stitch counts that were in the pattern? How does this egg compare to your M&M egg guys? Overall I think you did a great job! YAY! Let me know how they come along Dottie! Hi Rachel!! With Easter a few days away, I JUST realized I should crochet a few eggs for my toddler girls’ baskets….to be used later in their play kitchen. (3year old twins..I’m busy…but..I crochet….DAILY!!!) I tried 6 patterns that day….and last night I found your site. I was so excited, I stayed up LATE (til….3am…sshhh) and crocheted 12 eggs….all different colors….but like you said, none of the other patterns worked out right. YOUR PATTERN IS PERFECT!!!! I logged on now to print out all of the other patterns you have. Your pattern was quick, easy to understand, and I also used some scrap yarn up to make these eggs. My girls will be so excited to see what the Easter Bunny left. I have joined ‘Crochet Spot’ and I am so excited to see what you have to share going forward. I love the patterns I have seen so far. Keep up the great work!!! Hi Kim! I’m so glad that the eggs worked great for you! And don’t worry, I won’t tell anyone you stayed up till 3am 🙂 I hope your girls enjoy their Easter eggs. Also thanks for subscribing to Crochet Spot! HI! I used this pattern to make an onion instead! 😉 it came in handy, thank you very very much for sharing. Thanks Rachel! I can’t wait to try this egg. I bought some cotton yarn called Peaches and Cream and I hope I can make the eggs with this. What type kind brand of yarn did you use? Sometimes it helps to get other ideas of yarn other people use to give us newbies good ideas. Peaches and Cream should work fine. Honestly I don’t remember which yarn I used for the egg, since I made it a while ago. Rachel, please switch my name to my first name instead of my last. By the way I tried the Egg with Peaches and Cream and it has so far come out nice and even. I am at the decrease stage and even though I am new at this, I’m getting ready to stuff it. I was thinking of trying to figure out how to make a hinge and make the egg a box. 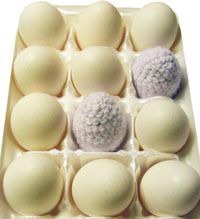 But, I would have to end early and then make a little coney shape egg top for the top. We’ll see. My mind is bursting outside the box with ideas, and then I have to figure out details. ha ha ha!!! Thanks for your pattern! Thanks for the easter egg pattern. I already started my first one, but I’m trying to think of a different way to close it, so that it would be able to open and close, so instead of stuffing I could put treats or something in it. I was thinking a small drawstring but I’m not sure, maybe it wouldn’t work at all! Just a thought! I know this is an old post, but I just found your site. Am I supposed to join each round or not? Thanks for your help! This pattern is crocheted like a spiral, no need to join. For any pattern on Crochet Spot, join only if it tells you to. Let me know if you need more help! Thanks so much! I’m new to anything but very simple baby blankets. 🙂 The egg turned out really cute. Five more to go and my daughter will have a 1/2 dozen for her play kitchen. Rachel, I saw your basket pattern and was in love, Then I saw your egg pattern and again, fell in love. Easter’s coming soon, so I’d better get crocheting up these cute little things. I think I’ll make a couple baskets full of these in “Sugar ‘N Cream” variagated yarn. I’ve made many things from your site, headbands, the basket pattern, soap savers out of my scraps and more! I strongly appreciate and reccomend this website to beginningers and experts! Rachel, I’d like to thank you for all your wonderful patterns and help. Thanks Christina! I really appreciate your feedback 🙂 Have fun crocheting and let me know if you ever need help with anything. Hi Janice, you can try using a larger hook with a ticker yarn or more than one strand of yarn held together to get a slightly larger egg. But a huge egg would require a different pattern. Okay, I have to be missing something. How exactly do I decrease? Do I just skip the next sc? I did the first half of the egg and it looked great, but then I got stuck. Help! Thanks for the Easter egg pattern. Tried other patterns but this one worked best for me to cover pastic eggs. I have made 4 baskets of eggs. Everyone loves them! Love your website. Hi- Should I slip stitch the rounds closed or is it worked continuously in a sprial? Hi Katey, the pattern is worked in the round like a spiral so no slip stitching is needed.